Hot, hotter, hottest – there’s probably no other (and no better) pain that we subject ourselves to on purpose than eating spicy foods. Did you know each of us perceive spiciness in a different way? It’s true. While some may almost spit fire when tasting a single ring of chili, others can’t get enough of it. However, the addition of chilis, pepper, or other hot ingredients like horseradish, garlic, or ginger cause nothing more than a painful reaction. Don’t forget to have a look at our article that discusses the refreshing effects of spicy food. At Kitchen Stories we love all creations and variations of spicy food, so we want to share our favorite recipes with you. Do you feel the sweat coming on yet? Nachos are almost always available at the snack bar of your local cinema. Although those are delicious, our homemade version beats them by far. The fiery jalapeño-cheddar cheese dip is to die for. Surprise your friends and make this recipe in advance of your next movie night! Our jalapeño cheese chips are something true spice lovers will enjoy as they burn straight into the heart—in a good way. You only need two ingredients and a few simple touches. Do you dare? Classic, practical, good. The spiciness of this dish is created by the addition of fresh ginger and garlic. Ready in only 20 minutes, it’s a perfect weeknight dinner. You want a warming soup with a touch of spice? Try the combination of potatoes, cauliflower, and horseradish—a satisfying variety of flavors for a hearty soup. You never can go wrong with this Korean chicken stew. Rich Korean chili paste and chili flakes provide the necessary excitement. Tender pork belly meets rice and vegetables coupled with star anise, cinnamon, and Chinese five-spice powder for an instant, spicy success! Spice up your salmon fillets with a fresh lime and sweet honey glaze. A drop Sriracha sauce makes it a pure enjoyment. Nothing is more refreshing than sparkling lemon with a dash of Tabasco on ice. The spiciness of our mezcal margaritas is sure to turn your head! Can you imagine a better combination than peanuts with sriracha? We, at least, love these vegetarian peanut soba noodles. A satisfying comfort food for spice-lovers. Chilis are available in countless varieties and levels of pungency, which are measured in Scoville Units. 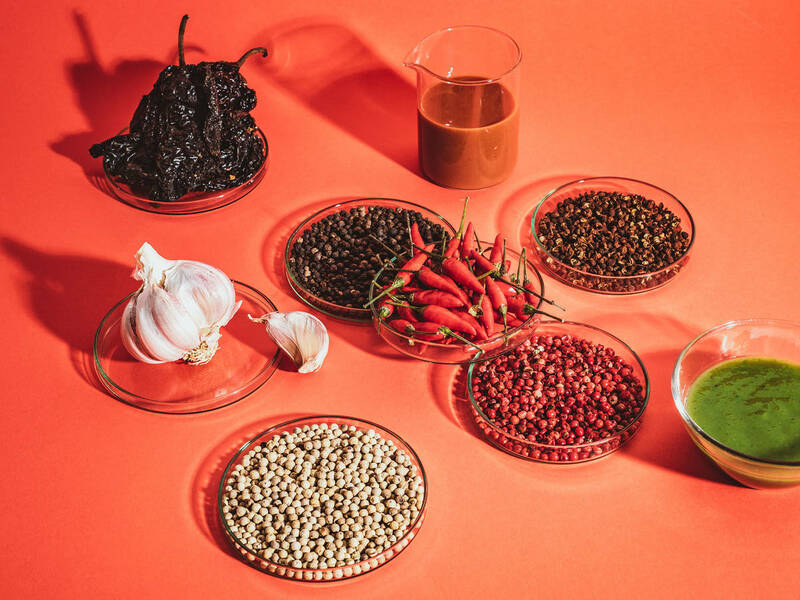 The scale hits maximum at a whopping 16 million Scoville–but don’t worry, these recipes are scalable, add only as much heat as you can handle. The creamy peanut sauce of our zoodle dish not only meets fiery shrimp, but also our taste! As a light dinner, a small bowl can make a big difference on both, cold and hot days. We’re big fans of this Indian classic—especially when it’s filled with chili and melted cheddar cheese. Craving something both fancy and simple? Nothing is more fun than offering your guests a snack like these avocado wedges, which are easy to prepare but very unique. Chili coupled with chocolate has always been a popular combination. With this recipe, you can enjoy the classic in liquid form. Especially on cold days, the spiciness heats you up from inside. Within a very short time, you can conjure up this peppery fish dish and give yourself a real taste experience that will have your head sweating—in a good way. Sick of sad desk lunches? Don’t worry, we have just the right thing for you: juicy chicken, crispy lettuce, fresh vegetables, creamy cheese, and not to forget—half of a chili pepper for an epic spicy taste! What are your favorite spicy recipes? Tell us in the comments!